Based in San Antonio, Texas, Softmath develops and markets its own education software for math students and teachers - from middle school through College. Softmath creates unique algebra software that fits in well with technology-in-the-classroom and ‘No Child Left Behind’ school programs. 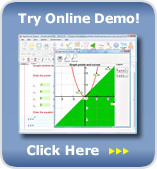 It’s a perfect choice for students who need supplemental help with their algebra homework. Here is our team: E-mail them with your queries, anytime. They’d love to hear from you! Technical Support Contact us with any questions you might have regarding the use of software, including downloads and installation. If you have a complicated expression that you have difficulties entering, scan it and send it to us, and we will promptly help you. Suggestions and Comments If you have any suggestions on how we could further improve our software, let us know. This could include your "wish list" of features for the next release or anything else you might think of. We thank you for being our most valuable resource for new ideas! Sales and Billing Questions related to ordering of our products should be addressed to our Customer Care Representatives. They will promptly resolve any issues regarding your purchase. For faster response, please enclose your order number. Multiple Licensing If you represent a school or are yourself a teacher, contact us with any questions concerning purchase orders, multiple licensing or if you would like to find out whether a custom made arrangement can be created for your school. Affiliate inquires are also welcome.